America's favorite dinosaurs are giving families a funny book, perfect for bedtime, storytime, anytime. Even when little dinosaurs are naughty, it's important to remind them that no matter what they do, they are always loved. Full color. 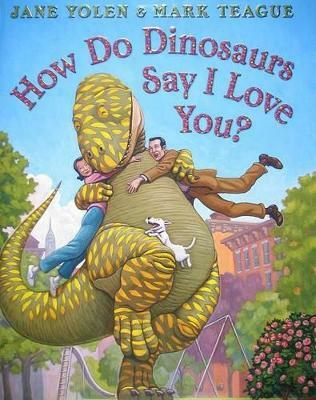 Parents and children can never have enough ways to say I love you --and now, America's favorite dinosaurs are giving families a funny book, perfect for bedtime, storytime, anytime. Even when little dinosaurs are naughty, it's important to remind them that no matter what they do, they are always loved. In this book, readers will laugh aloud as parents cope with the typical antics of childhood, but in the end, hugs and kisses show your little one how much you care. Jane Yolen is the beloved author of more than three hundred books for children and adults, including award-winning picture books, fiction, nonfiction, and poetry. Her How Do Dinosaurs... books have sold millions of copies and are international bestsellers. She regularly travels the globe speaking and teaching. Jane lives in Western Massachusetts and St. Andrews, Scotland. You can visit her at janeyolen.com. Mark Teague is the award-winning children's book author and illustrator of his own bestselling Dear Mrs. LaRue series, as well as The Sky Is Falling, The Three Little Pigs and the Somewhat Bad Wolf, The Tree House That Jack Built by Bonnie Verburg, and many other humorous picture books. In addition to his prized art for the How Do Dinosaurs... series, his illustrated novel, The Doom Machine, received excellent reviews. Mark lives in the Hudson River Valley with his wife and their two daughters.